Only 400 meters from Playa Migjorn, this stylish villa sleeps 14 people with the accommodation split between the spacious main house and two casitas in the garden, making it perfect for friends and families looking for sun, sea and sand. Casa Los Dragos is conveniently located, being in close proximity Playa Migjorn. Professionally styled, one will appreciate all the little touches the villa has to offer. This villa guarantees maximum privacy being set in the beautiful countryside, making it perfect for hanging out and Al fresco dining in the Formentera sun. The house has been recently decorated and welcomes you as soon as you walk through the door. With 260 sqm, there is plenty of space to accommodate up to 14 people. It is divided into a spacious main house with 4 en-suite bedrooms, capacity for 8 people and 2 separate casita’s of 40 sqm, each one located on either side of the house, sleeping 3 people in each. Wi-Fi and AC in all rooms are provided to make your stay as comfortable as possible. Daily or weekly maid service can be organised at an extra cost. Surrounded by countryside with snippets of the sea, the property is a relaxing place to spend some time. There is plenty of outdoor space, and gardens with comfortable terraces and seating areas ideal for gazing at the spectacular Formentera starry night sky. Casa los Dragos feels like a world away, yet is only a short walk away from Playa Migjorn swimming beach. 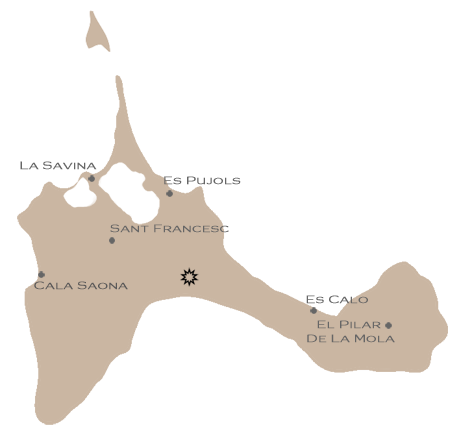 The casa is located in the area of Migjorn, 9 km from La Savina, 6 km from Sant Francesc and 2 km from Es Calo. 400m away from Migjorn beach & restaurants. Playa Es Calo is nearby if you want to try a different beach, and has various shops & restaurants . The main town of San Fransesc is 5 minutes by car or a short cycle ride away.